The Sunshine Mt. Hood greenhouse came out at the top of our reviews because of the variety it offers to the market. There are a limited number of wooden frame greenhouses on the market for 2019. The Mt. Hood is top quality within this category. With a reasonable price tag (starting around $2,400) for the quality. If you're looking for a more rustic look for your greenhouse and don't mind a little up keep on the frame the Sunshine could be a great choice. 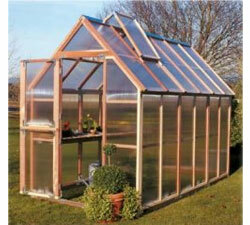 Along with the other greenhouses reviewed it offers an optimal growing environment and some useful optional accessories. Mt. Hood models are six feet wide with lots of headroom at 8'4" tall at the peak. Narrow enough to fit in a limited space, each kit is made with a clear natural redwood frame, twin wall polycarbonate and includes two vents with automatic vent openers, Dutch doors and a base made with recycled plastic gave this greenhouse a few bonus points in this review. Expandability: If you are not sure which size is best, the Sunshine series offers 4ft extension kits which can be added at a later date. This is a nice feature that only some hobby greenhouse kits offer. Ease of assembly: Pretty easy to assemble your greenhouse in a very reasonable amount of time --a 6' x 8' model, one of the most popular of the Sunshine brand, takes two people about three to four hours to complete with an additional hour or so need to unpack and inventory parts. Great Assembly Instructions: Another bonus of this kit was the instruction package included printed instructions as well as a video with fairly simple to follow instructions. In summary, the Sunshine Mt. Hood offers many of the same great features that make other hobby greenhouses on the market stand out, but the unique appearance that the wooden frame offers may set it apart for some buyers, from other greenhouse brands on the market. >> Research Sunshine Mt. Hood Product Specs!